Frederik November 27, 2014 Comment? 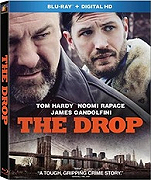 Twentieth Century Fox Home Entertainment has officially announced that it will release on Blu-ray director Michaël R. Roskam’s crime drama The Drop, starring Tom Hardy, Noomi Rapace, James Gandolfini, and Matthias Schoenaerts. The release will be available for purchase on January 20, 2015. A phenomenal cast, including Tom Hardy and James Gandolfini, lead this gritty thriller about Bartender Bob Saginowski (Hardy) and his hardened employer Uncle Marv (Gandolfini) who must choose between survival and loyalty when they find themselves caught in a robbery gone bad, and on the hook for a mob debt they can’t repay.